Our Embroidered Ladies Suits presents vibrant colors, which will make you look remarkably beautiful. Made of best quality fabric, this printed suit collection ensures utmost comfort and maximum ease.Fabricated to perfection, these suits are very durable and are reckoned for fine stitching. We have launched our array of high quality Straight Ladies Suit that are not only comfortable but also skin friendly suiting with the sensitive skin of kids. Our Printed Ladies Suit presents vibrant colors, which will make you look remarkably beautiful. 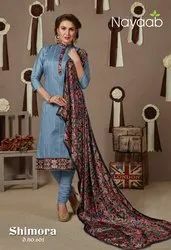 Made of best quality fabric, this printed suit collection ensures utmost comfort and maximum ease.Fabricated to perfection, these suits are very durable and are reckoned for fine stitching. We have launched our array of high quality Straight Ladies Suit that are not only comfortable but also skin friendly suiting with the sensitive skin of kids. Our Nayaab Semi stitched Suits presents vibrant colors, which will make you look remarkably beautiful. Made of best quality fabric, this printed suit collection ensures utmost comfort and maximum ease.Fabricated to perfection, these suits are very durable and are reckoned for fine stitching. We have launched our array of high quality Straight Ladies Suit that are not only comfortable but also skin friendly suiting with the sensitive skin of kids. Our Nayaab Designer Suit presents vibrant colors, which will make you look remarkably beautiful. Made of best quality fabric, this printed suit collection ensures utmost comfort and maximum ease.Fabricated to perfection, these suits are very durable and are reckoned for fine stitching. We have launched our array of high quality Straight Ladies Suit that are not only comfortable but also skin friendly suiting with the sensitive skin of kids. Our Embroidered dress material presents vibrant colors, which will make you look remarkably beautiful. Made of best quality fabric, this printed suit collection ensures utmost comfort and maximum ease.Fabricated to perfection, these suits are very durable and are reckoned for fine stitching. We have launched our array of high quality Straight Ladies Suit that are not only comfortable but also skin friendly suiting with the sensitive skin of kids.